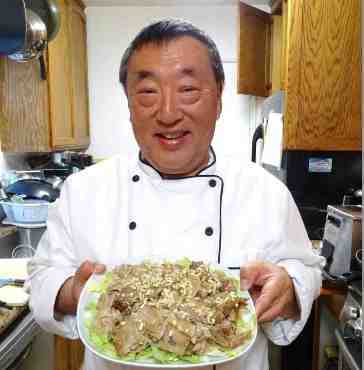 The “Far East Feast,” a fun and nostalgic journey back to the flavors of the old Far East Café in Little Tokyo, is returning to Pasadena on Saturday, July 22, and again on Saturday, Sept. 30, from 4 to 8 p.m. at the residence of Chef John Nishio. Chef John Nishio has re-created many Far East Cafe dishes, including almond duck. Presented by Nishio as a mini-fundraising dinner for the Grateful Crane Ensemble, the feast includes his re-creations of the “greatest hits” from the Far East Café — chashu, pressed almond duck, seaweed soup, shrimp with lobster sauce, ginger beef, mabo dofu and the aforementioned homyu, chow mein and pakkai. During the meal, attendees share family memories of their days eating at the Far East Café, and enjoy comparing the tastes of Nishio’s re-creations to what they remember from the restaurant. Along with a nine-course dinner, the evening includes a tour of Nishio’s backyard Japanese garden, a viewing of a Japanese American historical video produced by Nishio, and entertainment provided by Grateful Crane singers and musical director Scott Nagatani. Tickets are $125 per person. A limited number of seats are still available for the July 22 feast. For the Sept. 30 feast, seating is limited to the first 20 people. For information and reservations, call the Grateful Crane hotline at (310) 995-5841.